Two researchers from Washington presented a poster at the annual meeting of the American College of Preventative Medicine. They found increased risk of premature delivery and low birth weight in babies born to mothers who had been hospitalized for hyperemesis gravidarum (excessive vomiting and nausea in pregnancy). They also found the women to be at elevated risk for preeclampsia and for longer postpartum stays in the hospital, whether they delivered vaginally or by Cesarean. If you aren’t familiar with the condition, or how extreme it can be, you might want to read this woman’s account of her struggles with hyperemesis. Before IV hydration and tube feeding were available, women died from it. Unfortunately, the cause of hyperemesis is still elusive. And because hyperemesis isn’t well known and most women don’t have their first prenatal appointment until around their 12th week of pregnancy, they can be a month or more into their decline before they begin treatment. The condition how has a web site devoted to helping women who suffer from it, but it will take a lot of word of mouth to help most women realize there is morning sickness and then there is hyperemesis. One is a normal part of pregnancy, the other is a potentially life-threatening condition. I just finished a very enjoyable book, Delivering Doctor Amelia, by Dan Shapiro. Shapiro is a psychologist whose private practice has evolved into counseling physicians. He is also a cancer survivor with deep emotional responses to doctors' care and fallibility. Finally, he is also facing infertility issues at home because his cancer treatments left him sterile. These three strands intersect when one of the star obstetricians comes to him for therapy. She is afraid that a mistake she made at work has ruined a family. The book weaves together her story, as revealed session by session, and his visceral reactions to her as a patient and as a member of the medical establishment that at times betrayed him. I won't say more than that in case anyone decides to read it. As someone who has spent more than a few hours in therapy herself, I was fascinated by Shapiro's insights into the steps, questions, silences he uses in counseling and his motivations for them. His self-awareness and honesty made the narrative all the more complicated and engaging. He can't stop thinking about the baby he and his wife are trying to conceive, even as his client is talking about the baby she may have harmed. Most fascinating, however, is insight into the pressures, doubts, decisions and guilt the doctor struggles with, not only in relation to the case that brings her to Dan Shapiro, but in her daily work as a health care provider. This book was a much-needed counterpoint to the the anger I've been feeling toward the doctors who performed the Cesarean on my client last month. It shows the tensions OBs are balancing at each birth and the culture of detachment and bravado in which they are educated. It does not necessarily generate sympathy for obstetricians, but it at least provides depth to one example from the profession. And I'm so happy to return to it and see comments from all of you. Thank you for leaving notes. It is so good for me (and hopefully some of you) to have this place as a forum for thinking about birth. I truly appreciate readers' comments and want to respond to them all -- like a real conversation or dialogue -- but I'm also a bit behind right now so I will try to do that soon. Because in addition to my life as a doula, I work 30 hours a week at one of our local universities and when work heats up here, I have a tough time sneaking in a few minutes of internet searches and blog posts. I was out of town this past weekend. I, Spouse and our older son went to Toronto for a bit of R&R that included seeing the very fun and even philosophical musical, Wicked. Back to [my other] work. Here's a sweet story about an unplanned, unassisted home birth and the family that took it all in stride. The excited mother then gets scheduled for an appointment 10 weeks in the future. Ten weeks! She has to wait ten weeks to learn about appropriate nutrition. She has to suffer through morning sickness with no professional advice or treatment for ten weeks. She has to wait ten weeks to have her pregnancy validated through official recognition by her doctor. And if, like one in five women, the woman miscarries, she will likely wade through that with little or no contact with her doctor. I do not know whether this policy is intentional or not. For anyone who has faced pregnancy loss in the first trimester, however, it seems like a cruel plot. A recent study of British professionals found that men and women alike rated a miscarriage as the hardest life event they faced. Infertility was right behind. It is the height of negligence for doctors (and midwives; at least in this area CNMs follow a similar policy) to leave their patients to their own devices until they’ve cleared the first trimester hurdle. I can understand that it might be a financial loss to spend time with patients, 20% of whom will not ultimately produce the payoff of a birth. But I cannot forgive it. The emotional toll of miscarriage is huge, even when the physical cost is relatively low (to provide but one famous example, actress Kirstie Alley says her significant weight gain was fueled by unresolved grief from a miscarriage). By waiting until the first trimester – the time when most miscarriages happen – has passed before seeing patients, caregivers send a message that losses in that period do not matter. Women who miscarry in that window are not treated as mothers-to-be, but rather as bearers of doomed fetuses. Their pregnancies have not even been acknowledged by the medical community before they end. This plays in to the long-lasting feelings of guilt, failure and shame that many women feel about their miscarriages. I was pleased to hear one of our local homebirth midwife teams (and others I’m sure) begins caring for patients as soon as they are contacted by them. In fact, they consider it important to be in touch in the first trimester in case the woman miscarries. They treat that event with the reverence they would any other birth, plus some more because of the death entangled with it. Usually women wait until they are five to seven months pregnant to make their initial doula inquiry with me. Only when we go over their reproductive history do I learn about the painful pregnancy losses in their past. I would like women to know they can hire a doula early so they have that additional support in the event of pregnancy loss as well a birth. An Australian economist has released a study that assigns a multi-million dollar “value” to the breastfeeding work that mothers down under are doing. Her report will be the basis for a new policy encouraging breastfeeding because of its environmental, economic and health benefits. Dr. Julie Smith, author of the study, was quoted as saying, "Economics is about the efficient use of resources. At the moment we're wasting resources on producing (formula) milk, and on pediatricians looking after babies made sick by not being breastfed." How’s that for enlightened? And this from an economist, for pete’s sake. Meanwhile, Scotland now has a law whereby anyone trying to prevent a woman from breastfeeding in public can be fined. And what’s happening in the United States? Well a female comic had to cancel her act because the club where she was scheduled to perform would not allow her to bring her breastfeeding child (three months old) on stage with her, even though the baby was discreetly tucked away in a sling. Relatedly, I’m reading a book about how delivery outcomes affect breastfeeding success. There is a great photo in there, which I found a copy of on-line, of the Illinois women who founded La Leche League in 1956. Look at the photo. These look like Mrs. Cleavers, not founders of an organization that was, for its time, quite subversive. Prominent, suburban housewives banding together to promote the womanly art of breastfeeding? What must their neighbors of thought? Also, what would it take to get some prominent women from our communities today to promote something equally “radical,” like, say, home birth? If it’s happened before, it can happen again. Who out there can take up the rally cry? When I was in college, there was this great publication they sold at the bookstores called “Grading the Profs.” It was the unofficial evaluations of our professors, compiled and summarized in a little handbook. As I recall, it touched on the difficulty of the professor’s class, as well as his/her teaching style. It showed the number of evaluations used to make the summary and there was an overall numerical ranking. I’m sure statisticians would find the entire venture flawed. Students’ anecdotal experience, however, was that it was a pretty reliable tool for choosing between the various instructors of large courses. The past few years I have been daydreaming about producing a similar reference for childbirth caregivers in the Ann Arbor/Ypsilanti area. “Grading the Docs” would draw from evaluations provided anonymously by patients. There would be an “overall” category, and maybe one or two others (e.g. “Bedside manner,” “Willingness to work with patients’ wishes”), as well as THAT CAREGIVER’S c-section and VBAC rates. I would include representative comments. I would also allow the caregiver to supply a paragraph describing his/her practice and areas of special interest. Comments: Ms. Martin gets consistent marks for her skills and respectful patient care. Several respondents said she could be a little businesslike and remote at times, though all raved about her presence during births. Wouldn’t even this little bit of information be helpful to women who are basically throwing a dart at the list of caregivers? I still haven’t figured out a few key details like how to get the surveys in mothers’ hands (I doubt many doctors’ offices will agree to distribute them) and how to publish the results without being sued for libel. And of course getting those C-section rates is durn near impossible. I was surprised at my latest birth to hear the nurse say that they are no longer applying the triple dye to babies’ umbilical cord stumps. She said they found that the stumps dried up and fell off faster if they didn’t dye them. They still recommend alcohol treatment at every diaper change. I poked around on-line to see if I could learn anything about this. Methinks I found the reason. This raises the big cord care question I have never been able to get a satisfactory answer to. Is it good to put the baby in an herbal bath before the cord stump falls off. Hospitals and websites are adamant that you not give your baby a tub bath until the stump falls off. But many midwives I know encourage new mothers to take their babies with them into their postpartum herbal baths because the herbs have antiseptic and healing properties. As far as I know, no one has studied alcohol and sponge bath cord care against herbal bath cord care. I would be most curious to see the results of that. Incidentally, here’s a U.K. midwives’ site that has great information about cord care worldwide. Depending where you are you will find mothers putting everything from colostrum to dung on their babies’ cords. I was so excited about my post for today. I had some of the photos from the birth last week all ordered up for viewing. I was careful not to have any faces in them -- or at least not so you could tell who people were. But I hadn't yet gotten my client's explicit permission to use them. So I've pulled them. I am having a moral dilemma. I want this blog to be about births in general and my birth experiences in specific. Spouse has been playing devil's advocate, however, saying how would I feel if my birth story appeared on the internet, told by the person I'd hired to be my trusted birth companion. What if any idenifying details were removed? I counter. Well? he asks. I want to be able to write about my experiences freely. I do not think that would happen if I had to pass everything by my clients for their approval. Yet I feel somewhat like I am betraying clients' confidence, their invitations to their births if I go and write about them on the internet. For now my conscience is comfortable with reporting my take on births without client consent. Please check back. And weigh in if you have any thoughts or moral compass points for me. I'm taking a five minute pause here to honor this day, my older son's birth day. It was seven years ago today I pushed out my first crying, flailing collection of cells. Now he aggravates and annoys me more often than he inspires me. But he is certainly still capable of the latter when he forgets his first goal in life is to make me pay every minute of it for putting a younger sibling in our family mix. Today was a good day. Even though his little thorn of a brother was home from day care, recovering from a stomach bug, Avery and I managed to get some time together that was genuinely and mutually fun. It boggles my mind that he's closer to his teens than to being a newborn. There is a poem, “We Shall Bring Forth New Life,” that tells about a baby born in a dark and crowded basement in the immediate aftermath of the Hiroshima bombing. It is based on a true story. This may be old news for some people, but I only learned of it today. Its author, Sadako Kurihara, died over the weekend at the age of ninety-two. I interviewed with a prospective couple a few nights ago. Because they are due near the week I'll be out of town for summer vacation, I asked my doula partner and friend, T$, to come too. She would be as likely to attend the birth as I would so we wanted the couple to get a sense of us both. We may end up doing a "Double Doula" (trademark pending) birth for them: both of us assisting through labor. We did it once before and it was a blast. T$ and I had both been scheduled to interview with a couple. They were due between Christmas and New Year's, so we were both nervous about missing all of Chrismas Day for a birth, so we agreed to split shifts if the birth was a Christmas, but otherwise both attend. Ironically, that couple is who referred this week's interview to me. Both are lesbian couples. I'm delighted that the first couple was so pleased with our care that they recommended us to friends. This couple assured us they'd heard great things about us both. This couple also asked whether we had worked with other lesbian families. When we said no, they joked that they would "hook us up." Ann Arbor has a lot of lesbians -- and a lot of them are mothers. Lesbian births could be a pretty cool niche to work in. 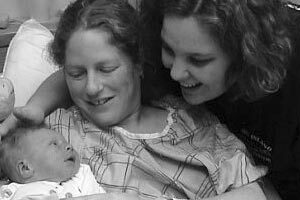 At the other couples' birth it was them, us doulas, and the birth mother's mother. And a female nurse and OB. That much pure female energy in one room for a birth was pretty amazing. And nary a man in sight (until the resident showed up, damn him). There appears to be a trend among women who start their family at an older age to seek in vitro fertilization not as a solution to infertility, but as a way to achieve their ultimate family size goals with one pregnancy. Separate articles on this subject have appeared recently from England and Australia. Meanwhile Sweden will soon pass a resolution allowing lesbian couples access to the same state-sponsored IVF treatments that heterosexual couples have. Gay or straight, as of next month you can’t get IVF in Wales if you or your partner is a smoker. Compliance will be tested with a blood sample. I take a recreational interest in personality or group skills "typing" tools such as the Myers-Briggs Type Indicator and the DISC Profile. I've come up with my own: the Jigsaw Puzzle Personality Profiler. The idea came to me after Spouse and I had a heated discussion about the merits of an old jigsaw puzzle of mine that I retreived from my parents' attic. It's 500 pieces of chocolate chip cookies, some flying out the top of an overflowing cookie jar. Needless to say, it's a lot of brown and black. Spouse kept looking at it and shaking his head. Finally he said, "I don't see how there can be any appeal to doing something like that. All the pieces look the same and when you get done, you just have a picture of cookies." He, too, enjoys jigsaw puzzles. But he much prefers the New England landscape variety. The more we talked, the more I realized people have very different motivations for doing puzzles. I like the challenge of finding order among so many similar pieces. Indeed, one of my favorite puzzles is the image of a jigsaw puzzle, where each piece is a different color. That image has been cut up into jigsaw pieces so that each piece contains several colors. It's damn near impossible. But also a lot of fun. Others enjoy puzzling, literally, for the big picture, making something singularly beautiful and integrated out of small fragments. I think these people also like to keep the finished product around for a while. If you prefer interesting images over difficult assembly: You are a visionary. In any situation, you imagine possibilities, rather than dwell on limitations. You think about the future more than the present. You can be given to flights of fancy and sometimes need others to bring you back to earth. Your creativity and ability to synthesize pieces of information make you an inventive problem solver. If you prefer difficult assembly over interesting images: You are pragmatic and detail-oriented. Methodical progression through a problem is as appealing as reaching a conclusion. You are an analytical and patient problem solver, though you can shoot down others' ideas if they seem too far-fetched. You tend to lose patience with dreamers. You much prefer to operate in the present reality. If you prefer just about anything to doing a jigsaw puzzle: You are an active body with little patience for starry-eyed naval gazing or meticulous inspection of life's details. Your motto is "Seize the Day." You can be seen by others as a task master and possibly as bossy (Mom! ), but you're also likely to be the first set of hands involved in resolving a problem -- provided it's one that can be solved physically. Am I on the money? Should I get a patent? My March client called me today. She had a checkup this morning at which her doctor recommended she have a Cesarean birth this Friday. Why? Because the baby is still very high, there has been "no change" in the mother's cervix during the past two weeks (she isn't dilated, is "only" 50% effaced and the cervix is very posterior). Am I missing anything? Oh, yes. They think the baby will be large, around nine pounds. The doctor told my client, "It looks as if your baby is telling us he won't come out on his own." It seems to me there are two ways to interpret this information. Either you say (and speculate) that the baby WON'T come out or you say the baby IS NOT READY to come out. Did I mention that the mother is still 3 days shy of her official due date? If she has two more weeks to go to be within the normal range of deliveries, how can you pass judgment now on what will happen when her body and baby are ready to labor? The up side for me is that I will attend the birth. I have not been present at a Cesarean birth before. I'd just as soon miss the chance if it meant she could have the baby vaginally, but I guess that goes without saying! I’d like to give a shout out to all the gals who are keeping doulicia up to date on birth related news. Thank you Hannah for posting the link to MaternityWise’s response to the “Early Epidurals are O.K.” article. This is the information I was looking for and unable to find. Thank you T$ for calling just now to say you’d found hard evidence of the rumored plan of a local retirement facility to add postpartum doulas to their services. The Whole Foods Market in town had tacked on its community notices bulletin board fliers for “Bringing Baby Home,” a service of Glacier Hills Home Care (see this PDF at page 4 for more information on Home Care). I guess I need to get off my office chair and do a little sleuthing myself! My doula friend and I were talking about knitting. Many midwives and doulas knit. It’s a great way to pass the time and remain present at a birth. She sent me a link to this nice story by Pam England about a knitting midwife and what her pastime meant to hear patients. Two days ago my book group was debating whether lead could be passed to a baby through breast milk. One of the women’s daughters had high lead levels. The mother asked whether it could be something she was passing on to the baby through her milk. He didn’t know. Now there’s the internet, and in two quick clicks I found out that lead can indeed be passed through the breast milk. But unless the mother has lead poisoning, she should continue to nurse as the level of transmission is quite low. Then today I got this link sent by a former doula client, about how perchlorate, a toxin found in rocket fuel, is showing up in breast (and cow) milk across the country. It makes me think again that if mothers could organize, they would be a lobby far more powerful than any corporate-based group. Does any mother want perchlorate in her breast milk? If mothers marched on Washington demanding better environmental standards for their children they could flood the district and several surrounding counties. Not to mention the economic impact of a boycott (or a strike).